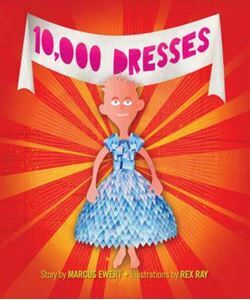 This story is told from the view point of Bailey, a young transgender girl who dreams of dresses. At first, when Bailey tells her parents that she wants to wear dresses, they become angry, and tell her that she's a boy. Her older brother calls her "gross", and threatens to hurt her. But soon Bailey meets an older woman across the street who seems more accepting about Bailey's love of dresses. The lady explains that although she wants to make dresses with her sewing machine, she doesn't have any design ideas. Together, Bailey and her new friend create a dress with mirrors on it.